While tupperdors are great for cheaply and effectively storing small quantities of cigars, coolidors are better for larger collections. Not to be confused with cigar cooolers, a coolidor is a portmanteau of “cooler” and “humidor”. Initially, ice coolers were the most popular container used for coolidors thanks to their insulating properties. However, any large storage container adapted to cigars will do. Use the above links to jump ahead if you want. You can also head to the menu below to see the recommended products that will be featured in this guide. You can jump ahead by using the links above. Alternatively, scroll down to see them all. We’ll outline the requirements for a quality coolidor later on but a high-quality coolidor consists of BPA-free plastic and an airtight seal. While not strictly a cooler, the Iris USA’s storage container is an excellent storage option for your cigars. 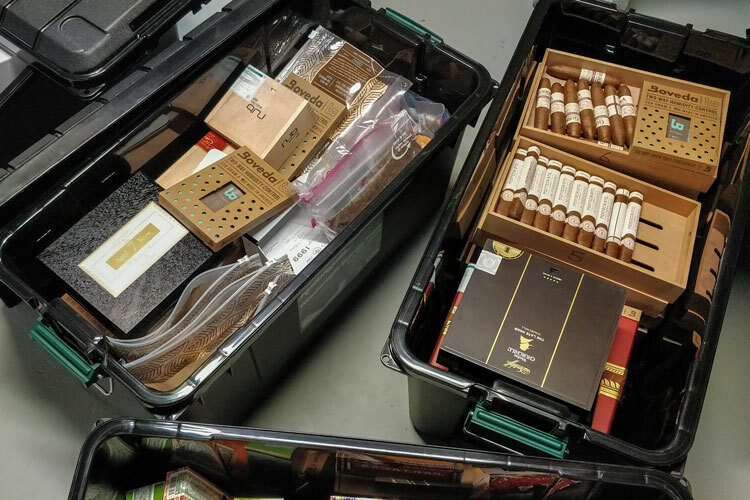 It doesn’t provide the same level of insulation as a cooler but it is large enough to contain over 500 cigars and probably much more unboxed. The real number may be less, however, as we recommend that you use shelving and boxes to prevent them getting damaged. Nevertheless, this is a very large and affordable container with an airtight seal. Finally, the Iris USA Remington is the only one to feature its own gasket, which provides a great seal on its own for airtight storage. Coleman is a renowned American brand that offers some of the most appropriate coolers for being converted for cigar storage. Every cooler is made with BPA-free plastic and features and excellent seal. This particular cooler has a telescopic handle and is set on wheels. Consequently, it can be easily transported if necessary. In our experience, this model provides the an excellent environment for our cigars but it is on the small side for a coolidor. Although this model doesn’t have a seal that’s effective as the smaller Xtreme model, it’s still an excellent choice. Furthermore, it’s large size provides enough space for nearly 800 cigars, which is as much as a cabinet! As with the other Coleman Xtreme, this cooler is insulated and quite easy to transport. Therefore, you can move it around the house or take it elsewhere if needed. Why Make A Cigar Coolidor? The tupperdor’s bigger brother, coolidors are a very attractive concept for people with larger cigar collections. As your collection grows, the space that you require for storing them will too. Unfortunately, cigar cabinets can get outrageously expensive and they require a lot of space. Therefore, it isn’t always the best solution for people in average-sized homes. Meanwhile, coolidors offer versatile and practical storage that can be tucked away in a basement, garage or closet. Some serious collectors will even own several coolidors so that they can age their cigars in different environments. Given that they’re quite affordable, it offers you the opportunity to do this without a large budget to match. Firstly, the most attractive prospect of building one or several coolidors is that you will have access to a lot of storage space. As you’ll be able to do this in a cost-effective way, you’ll have more flexibility in the amount of storage space that you create. Furthermore, coolidors offer much insulation than the majority of humidors and will be able to protect cigars in hotter climates. However, not all coolidors are made from coolers. Similarly, their dark colours and airtight seals means that the cigars are kept in the dark and away from sunlight. In fact, it can be more convenient to use regular airtight storage containers as these are stackable. Cigar enthusiasts with particularly large collections will appreciate this as they’ll be able to stack their storage out of the way. Once a coolidor is properly set up, there won’t be much that needs doing save for periodically checking the temperature and humidity. This requires considerably less work than wooden humidors that need seasoning and regular care to prevent the seals from wearing. Like tupperdors, coolidors offer reliable storage that’s very cheap and low-maintenance. Their airtight seals can even provide a better environment than more expensive wooden humidors. Nevertheless, just like tupperdors, coolidors aren’t without their shortcomings. Being also made from plastic, they may first arrive with a strong synthetic odour. Furthermore, the smell tends to persist longer than with tupperdors and can affect the taste of your cigars. Therefore, you may need to air them for some time before being able to actually use them. Needless to say, coolidors aren’t particularly attractive either. Unlike a proper cabinet or even a desktop humidor, they’re unlikely to be the centrepiece of the room. Consequently, they tend to reside in exile somewhere in the basement like the Elephant Man. Some people may find this annoying as it can be a hassle to get their cigars. However, most coolidor owners will keep a humidor in the same to have easier access to a selection of stogies. Coolidors are also notorious when it comes to organising. 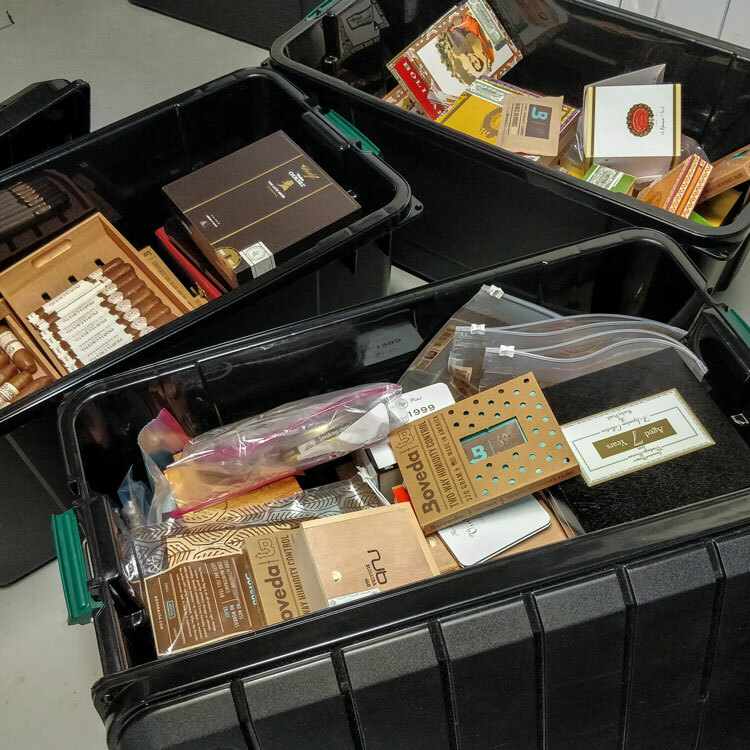 Their contents can quickly become a mess and it’s challenging to sift through the piles of boxes to find the cigars that you want. Similarly, you’ll need a lot of shelving, which won’t be the same dimensions as the coolidor. Nevertheless, most of your cigars will likely remain in their original boxes in order to protect them from knocks and bumps. Finally, it can be challenging to find a coolidor that’s actually airtight. Most will be advertised as “weathertight” but due to child safety, there may be air holes to prevent accidents. As such, some coolidors may need to be retrofitted with gaskets and seals to ensure that they do what they’re supposed to. In order to build a coolidor, you’ll need a buy a few products that will ensure that your cigars are stored properly. You may have already realised this but you’ll need a cooler in order to build a coolidor. However, bear a few things in mind when choosing your cooler. Firstly, consider whether you actually want a cooler or a tote-style storage container. While a cooler will offer better insulation for particularly hot climates, they tend to be heavier and more awkward for storage. Meanwhile, storage containers will provide just as much protection yet are made from lightweight plastics. Furthermore, storage containers are often stackable so you can have several on top of one another. Whichever container you choose, make sure that there is a good airtight seal. Otherwise, you may have to awkwardly glue a gasket to create one. If your coolidor isn’t airtight, you’ll lose all the humidity inside, which may dry out your cigars. Furthermore, try to opt for BPA-free plastics or even some that don’t have any phthalates. Such toxins can impart a strange flavour in your cigars. Furthermore, they’re known to be unhealthy… Unlike cigars… Still, why take the extra risk? Next, you’ll need to invest in the most appropriate humidifer for your coolidor. These devices release moisture to ensure that the humidity level remains constant inside the humidor. As coolidors will be full of products and may be moved around, you’ll need a humidifier that won’t spill or leak. Furthermore, a coolidor should be airtight and isn’t made from a material that easily absorbs moisture. Therefore, you’ll want something that’s adapted to the coolidor’s capacity to avoid over-humidification. Similarly, a humidifier that offers two-way humidity control will help avoid this as they absorb excess moisture rather than continuously releasing it. For all the reasons listed above, we’d recommend Boveda’s humidity packs as the most adapted to coolidor cigar storage. Firstly, they’re hassle-free and won’t make a mess. Furthermore, they also offer the afrementioned two-way humidity control. However, we’re looking at potentially very large storage spaces. As such, the regular packs won’t be sufficient for cigar storage. Instead, you’ll need Boveda’s heavy duty 320g humidity packs. These meaty packs will provide enough humidity for 6 times the amount of the regular ones. This comes to 150 cigars or around a cubic foot of storage space. You’ll likely need a few of them for your coolidor but they’re hassle-free and you can’t over-humidify your container with them. Naturally, you’ll also need a quality hygrometer in order to keep an eye on the container’s environment. By periodically checking the humidity levels, you’ll be able to take action if there are any fluctuations or drops. However, don’t forget that it’s important to use a calibrated hygrometer to be sure that your readings are accurate. Furthermore, you’ll want to use a digital hygrometer as analogue hygrometers are renowned for being inaccurate. Otherwise, there are also smart sensors that use wireless technology. These allow you to consult readings on your phone without having to actually open the container. While it’s not strictly necessary, we do encourage including some cedar in a coolidor in order to reap from its natural properties. After all, this is one of the key reasons to buy a wooden humidor in the first place. Although some Spanish cedar veneer should be fine, you might prefer to include some actual shelves. This will not just provide you with the benefits of Spanish cedar but you’ll also gain some convenient storage space. The only drawback here is that the shelves may not be the same dimensions as the cooler. However, this is one of the disadvantages when working on a budget. Nevertheless, be sure that your shelves or veneer is made from Spanish cedar. Unlike other woods, Spanish cedar is highly absorbant and will be able to hold excess moisture. This can help reduce the shock when there are fluctuations in humidity as it will act like a buffering membrane. Furthermore, Spanish cedar is a natural insect repellent and will help ward aware pest such as tobacco beetles and worms. Finally, the scent is quite pleasant and can add an aroma to the cigars, which we find much more agreeable than the smell of plastic! Now that you have gathered all the necessary materials, it’ll be time to start building the coolidor. If all goes well, this process is generally quite easy. Overall, it’ll take maybe a few days but most of that consists of waiting. Firstly, consider seasoning any cedar shelves or veneer in advance as this can take some time. Before any cedar comes into contact with cigars, it needs to be properly seasoned. If this step is neglected, the dry cedar will absorb any moisture it can inside the coolidor. Generally, this means that the humidifier won’t perform well, but it may affect your cigars too. We offer a full seasoning guide that will introduce you to a number of methods for seasoning a humidor. However, we generally prefer to use Boveda’s 84% seasoning packs. While it may take longer than other methods, it requires considerably less effort. As we highlighted before, coolers and storage containers tend to have a strong plastic odour. This tends to be pretty strong when new and eventually dies down. However, as long as the smell is present, we’d refrain from storing the cigars in them. After all, you don’t want that plastic smell to taint your cigars! The best way to get rid of the odour is simply by airing the coolers until it goes away. This may take as little as a day but it could take longer. Simply leave the cooler wide open outside or in a well-ventilated room. If you do leave it outside, make sure it’s not somewhere where it might get filled with rain! Once the smell has dissipated, you’re nearly ready to start using it properly! While your container is airing, make sure that you calibrate the hygrometer if you haven’t already. Calibrating a hygrometer usually takes between 24 and 48 hours, which will probably be the same amount of time that your cooler is airing. We’ll soon be offering a full guide on calibrating humidors but until then, avoid using unreliable methods. For instance, a water and salt solution in a ziplock bag will rarely give you an accurate result. Instead, we’ve discovered that Boveda’s calibration kits offers the best calibration for hygrometers. Now that you’ve followed all the previous steps, you’ll soon be ready to start filling the new coolidor with your cigars. However, first you’ll need to set it up and let it sit for a few hours. Equip the coolidor with the necessary humidifier, hygrometer and shelving. Now wait a few hours for the humidifiers to have fully diffused the moisture throughout the cooler. 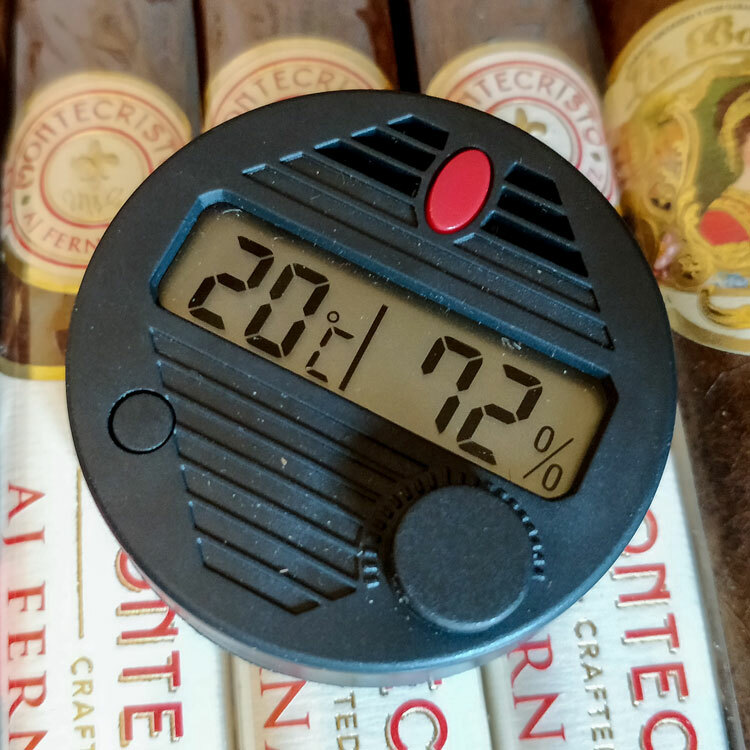 Once the hygrometer is giving a consistent reading, you’re ready to add your cigars! Having now learned how to build one, discover our recommendations of the best materials for ensuring that your coolidor is sufficiently equipped. While tupperdors can be a lot more frugal in the equipment used, coolidors are much larger. As such, you should make sure that your storage isn’t under-equipped. The Boveda 320g packs offer the performance of six regular 60g packs. They’re compatible with all regular humidors but become a necessity when you need to humidifier larger spaces. They’re more convenient than regular packs as you have extra power in a single package. One is able to humidify the capacity of 150 cigars so you’ll likely need a couple of these for your coolidors. While not strictly necessary, these metallic mounts for Boveda’s 320g can be quite handy. If you want to ensure that your coolidor is neatly organised, you’ll likely appreciate the functionality of these mounts. As they’re magnetic, you can use magnetic stickers in order to fix them onto the walls or lid of your coolidor. Furthermore, you can use them on other humidors in the future so we’d argue that they’re a worthwhile investment. While lining is likely enough for tupperdors, you’ll probably want a little extra cedar in your coolidors. 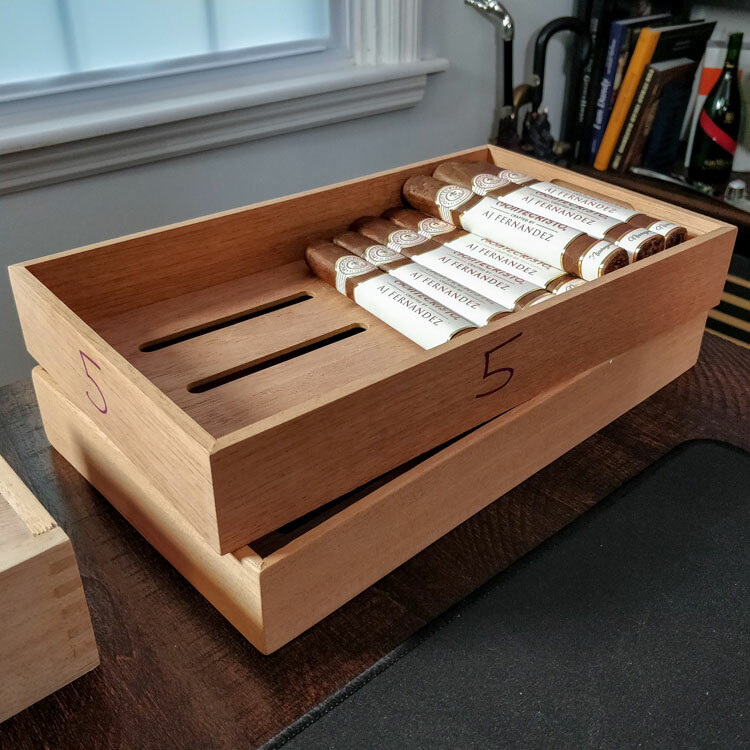 Trays such as these won’t just provide you with the benefits of Spanish cedar but will make it considerably easier to organise your collection. Consider grabbing a few of these for the single cigars that aren’t going to be stored in their boxes. A great little hygrometer that we love to use, the Hygroset does have its shortcomings but it’s an overall great device. Furthermore, it’s very affordable so it might be worth grabbing a few to check the humidity throughout an entire coolidor. Make sure that you calibrate it beforehand. Afterwards, expect a tolerance of -/+ 2% humidity and 1° in temperature. 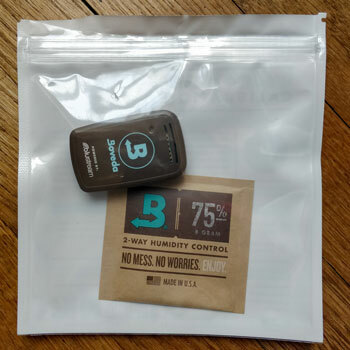 The Boveda Butler is a smart sensor that feeds its readings directly to your smartphone via Bluetooth. 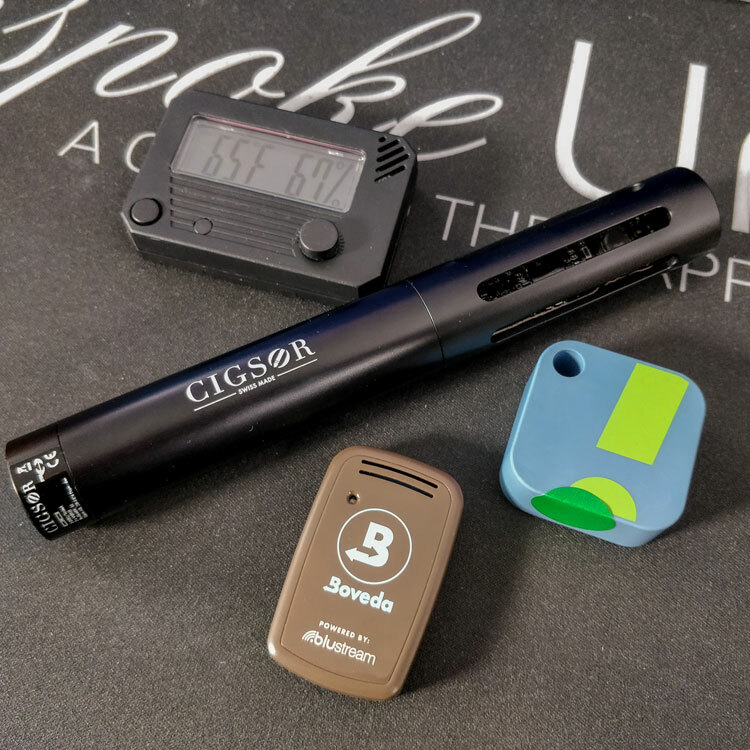 With its calibration wizard and well-designed iOS and Android apps, you can periodically check on your cigars without ever opening the container. Having now fully explored coolidors, consider consulting some of our other guides to learn about other cigar storage solutions! Reviewed by Thomas J., on 22nd October . "Brilliant! I've been looking to expand my cigar collection for months. Reading this guide has finally given me the resources that I needed."